This is a short, useable set of criteria for evaluating multimedia compositions developed by T. Rickert and C. Charlton for English 106 at Indiana University. The self-styled “crib sheet” begins by laying out the criteria that we commonly use for assessing print-based essays. 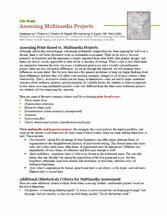 Noting that multimedia projects share some of these criteria, the authors add a list of “Additional Criteria for Multimedia Assessment,” with a quick gloss on each of the listed criteria.